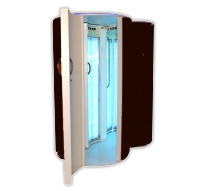 This is our last remaining limited used ex-salon Sunburst 200 sunbed. So if you are after a stylish looking bed with low maintenance but high performance that will enhance the image of your salon then look no further. The Sunburst is in excellent condition and as we need the space, grab yourself a real bargin. The Sunburst comes with 48 x 6ft tubes. The perfect amount to provide the customer with a Golden 360 Degree Tan. It has a fantastic cooling system that not only keeps your customers from getting that uncomfortable over heating feeling, but it also helps to ensure that the tubes are working at the optimum temperature for maximum life expectance. Add on changing area. A great idea for customer privacy and space saving in your salon. It has a courtesy light and vanity unit. Easy to wipe floor and inside latch lock. 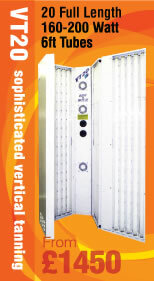 Also available in 160, 180 or 225 Watts and a choice of 16 vibrant colours. Courtesy light & vanity unit. 8640 Watts of pure tanning power. Available in 16 vibrant colours.